Bill Ballou thinks closers, even Mariano Rivera, don't belong in the Hall of Fame. I think the first three words of that sentence are wrong. Bill Ballou, a Worcester (MA) Telegram sportswriter whose coverage includes the Red Sox, proclaims adamantly that he refuses to vote for Mariano Rivera for the Hall of Fame. He thinks closers may well be the most overrated men in uniform during a given baseball game, this side of designated hitters, if only because when they are brought into games they have it just too simple. Unfortunately, simple is also a polite way to describe Ballou’s full argument. Quibble if you must about the save rule. 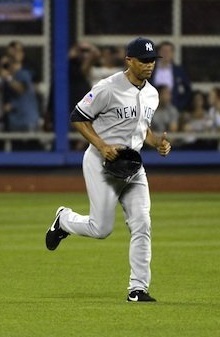 As defined now and throughout The Mariano’s career, a save situation for a relief pitcher is when he comes into the ninth inning with his team leading by three runs or less; or, he comes in with the tying run on base, at the plate, or on deck, regardless of the score; or, he pitches for three innings. It’s one thing to object to the save qua the save, but it’s something else to suggest a man who was the best at earning saves under the incumbent rules of his long career shouldn’t have a place in the Hall of Fame. The Hall is first and foremost supposed to be about greatness above and beyond the merely excellent, within the boundaries of the rules of baseball’s play, and by that definition alone Rivera should be a no-questions-asked, first-ballot, unanimous Hall of Famer. Even Red Sox fans acknowledge as much. Which reminds me that even the most sour citizen of Red Sox Nation who thinks Rivera was nothing more than a single-inning save machine could not have seen him pitch in Game Seven of the 2003 American League Championship Series. When he came in for the ninth and pitched through the eleventh, keeping the Red Sox from misbehaving despite a single in the ninth (Jason Varitek) and a two-out double in the tenth (David Ortiz), and with four strikeouts including two in the eleventh. The now-manager of the Yankees rewarded The Mariano’s work that evening in the bottom of the eleventh, with a first-pitch leadoff launch into the lower left field seats for game, set, and Yankee pennant. Rivera was credited with the pitching win. And if Ortiz hit a two-out double off him, so what? That’s what Hall of Famers do even unto other Hall of Famers once in awhile. It’s also fair to say that Price’s one-run masterpiece and Series MVP Steve Pearce’s mayhem at the plate (a two-run homer in the top of the first; a solo bomb in the top of the eighth), not to mention the solo bombs Mookie Betts and J.D. Martinez ripped off—what do you know—future Hall of Famer Clayton Kershaw are and will be remembered far more than Sale’s spotless ninth. (For which the rules say he couldn’t be credited with a save, since he had a four-run lead to protect.) You’d think a Red Sox writer would have known that despite Sale striking out the side. Ballou audaciously mentioned Craig Kimbrel, the Red Sox’s 2018 closer, in the same area code as Rivera. “[H]is performance in the postseason was an abomination,” Ballou begins. “When he pitched, Boston’s victories felt like defeats. In 10-2/3 innings he had an ERA of 5.90, and permitted 19 baserunners. He was also 6 for 6 converting saves — a perfect record.” Oy vey. Argue all you wish that the save rule, if not the save concept, is overdue for an overhaul, but comparing Rivera’s work to Kimbrel’s is rather like comparing the millionaire who made his fortune from his own creation to the millionaire whose fortune came from organised crime. And if you can name a Rivera save about which it was fair to say a Yankee win felt like a defeat, well, as the old song says, mister, you’re a better man than I. He wasn’t without his (very) occasional mishaps on the mound, of course. As often as not it required the dramatic to beat him. It took a game-set-Series-ending base hit floated over the infield into shallow center field for the Diamondbacks to beat him and the Yankees in the 2001 World Series; it took a pinch-runner’s stolen base and a prompt RBI single to tie Game Four of the 2004 American League Championship Series against him when the Red Sox refused to go gently into that good gray series-sweep night. Game breakers and game changers like those have wrecked far lesser pitchers. Both times The Mariano merely picked himself up, dusted himself off, gave credit where due without apology or hesitation, and got right back on with his career. “The game that you’re going to play tomorrow,” he once said, “is not going to be the same game that you just played.” That’s the way a Hall of Famer thinks. Reality reminds us that even Hall of Famers get beaten now and then by other Hall of Famers. Willie Mays hit eighteen home runs in his career off Warren Spahn, with a .305/.368/.587 slash line (batting average/on-base percentage/slugging percentage), and nobody credible would suggest that makes Spahn less a Hall of Famer. (“If I could have struck you out,” Spahn often needled Mays about surrendering Mays’s first major league home run, “we’d have been rid of you in a hurry.”) Pedro Martinez couldn’t get Craig Biggio out with a restraining order (Biggio’s slash line against him: .302/.400/.488), but the credible wouldn’t be caught dead arguing that it makes Martinez less a Hall of Famer. Jay Jaffe, the Sports Illustrated writer who is to Hall of Fame analysis what Aleksandr Solzhenitsyn was to the Soviet Union’s totalitarianism, reminds us that Rivera was better at run prevention under his own devices and relative to his league than any other pitcher; and, that his teams missed only two postseasons while he held his job and was the last man standing on the mound four times, an unprecedented accomplishment. Jaffe also observes that The Mariano is in the conversation when it turns to signature pitches and the pitchers who threw them, his cutter in the same league as Sandy Koufax’s curve ball, Steve Carlton’s slider, Hoyt Wilhelm’s knuckleball, Bruce Sutter’s split-fingered fastball, and Martinez’s changeup. Rivera’s lifetime ERA+ (205), the number that measures your run prevention adjusted to all the parks in which you pitched, not just your home park, is the highest in baseball history at this writing among pitchers whose careers involved their working 1,000 innings or more. “[He] allowed fewer than half the number of runs a league-average pitcher would have allowed over the same number of innings,” Jaffe says. Number two at this writing is Kershaw’s 157. But since Ballou makes an incessant point about the single-inning closer, it’s wise to remind yourself, as Jaffe does, that Rivera’s record 652 saves include 119 in which he pitched more than a single inning, usually being brought in in the eighth with men on base to greet him. In the post-1992 expansion era, Jaffe records, Rivera’s 119 are well ahead of the two gentlemen tied for second with 55 each—Hall of Famer Trevor Hoffman, and Keith Foulke, who just so happened to be the last man standing on the mound when the Red Sox broke the actual or alleged Curse of the Bambino but wasn’t a Hall of Famer on the best day of his life otherwise. The active pitcher with the most such saves is Kenley Jansen—with thirty. Forget putting the pedal to the metal, to catch Rivera they’ll need a supersonic jet. If you’re inclined to measure a relief pitcher by his wins above a replacement-level player, you might care to record that Rivera’s 56.2 WAR is the most of any relief pitcher earning WAR strictly in that role. (Hall of Famer Dennis Eckersley earned more of his 63.0 WAR as a starting pitcher, including all 38.1 of his peak WAR.) Lee Smith, freshly elected to the Hall of Fame (by the Today’s Era Committee) and holder of the career saves record before Rivera obliterated him, has 29.4 WAR—eleventh among pitchers who accumulated half or more of their WAR out of the bullpen. Remove Luis Gonzalez in the 2001 World Series and Dave Roberts (the stolen base)/Bill Mueller (the followup game-tying single) from the picture and, if you thought Rivera was deadly in the regular season, in the postseason he was a weapon of mass destruction. In 141 lifetime postseason innings his ERA is 0.70. No pitcher who’s pitched more than 26 postseason innings goes that low, not even Koufax or Lefty Grove. The Mariano in the postseason struck out 110 batters (a 7.0/9 innings rate), with a 1.3 BB/9 rate (he only walked 22 in those innings), and only two men ever took him over the fence in the postseason—Sandy Alomar, Jr. (Game Four, 1997 AL division series), not a Hall of Famer but not inconsequential, either; and, Jay Payton (Game Five, 2000 World Series), not a Hall of Famer and very occasionally consequential. Payton teed off for a three-run homer with two out in the bottom of the ninth. So what did Rivera do from there? He caught Kurt Abbott looking at strike three to nail the only World Series in which the Yankees played the Mets, and that Series was actually closer than its brevity suggests. It proved that there are times in baseball when lesser assailants just don’t always know or care that they’re supposed to surrender to Hall of Famers, and that even Hall of Famers can be caught off guard by or make a mistake against the modestly endowed. Rivera is as famous for his humility as he is for his mound deadliness. Imagine the blush across his friendly bronze face when he thinks that the number one argument over his Hall of Fame election is not whether he belongs on his first ballot but whether he should go in the way even numerous Yankee legends didn’t, not even Babe Ruth, Lou Gehrig, Joe DiMaggio, Yogi Berra, Whitey Ford, or Mickey Mantle went in—unanimously. Rivera didn’t create the rules of saving or closing games, and it would be craven injustice to deny his honour for doing his job under those rules and conditions better than anyone else who had the job before or while he did. Ballou’s silly position means two things, really: 1) The Mariano’s chance of becoming the Hall of Fame’s first unanimous election isn’t ruined, because Ballou’s will be an unsubmitted ballot. 2) There’s a stubborn integrity to a man who’s willing to stand without apology even if it exposes him as full of Ballouney. Page created in 1.022 seconds with 21 queries.